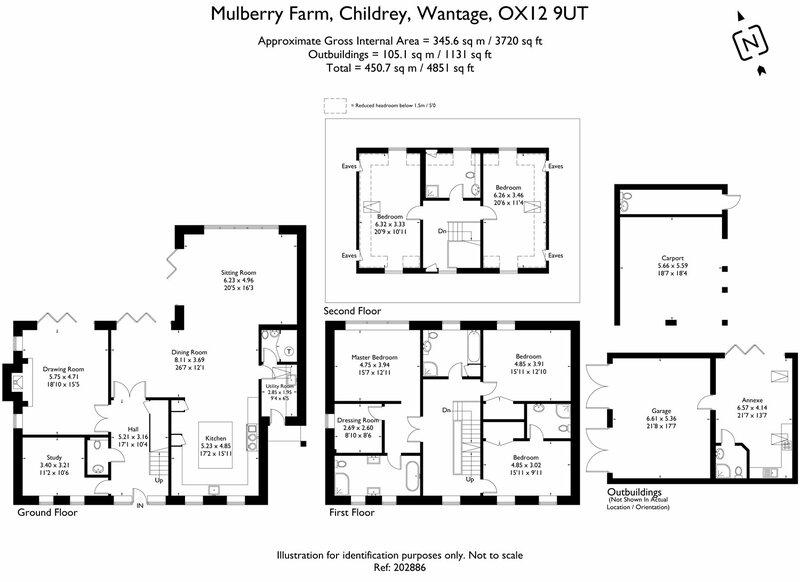 Approx 4851 sq ft including annexe, double garage and carport. Open planned Kitchen with two sets of bi-fold doors leading to terrace, vaulted ceiling with floor to ceiling windows taking in the view. Neptune Kitchen with electric Aga and companion. Integrated Siemens appliances including American style Fridge/Freezer, 2 dishwashers, wine cooler, induction hob ancillary to the Aga. Mulberry Farm stands on the edge of the village of Childrey with far-reaching views. Childrey has an excellent range of local facilities including a post office/shop/coffee shop. There is a well-regarded primary school, a beautiful church, village green and a picturesque duck pond. Several independent schools are within easy reach. Air source heat pump with underfloor heating to ground and first floor with radiators on the second floor. Mains water and electricity. There is a pump from the property which connects to mains drainage. a number of providers including Vodafone unlimited fibre with up to 76mbps.